In the fall of 1959 Frank Crawley, head coach at Warwick Vets was intent on finding a way to develop local interest in ice hockey which would ultimately benefit the city's high school hockey program. Along with a number of friends who were active in other youth programs in the city, plans for a junior hockey league were formulated. Joining Frank Crawley as founding members of the program were Ray Walsh, Swede Erickson, Joe and Fred Warburton, Ed Thayer, Art Soder and Herb Robinson. Joe Warburton was an active and permanent member of the Board of Directors for Warwick Junior Hockey, until his passing in September 2008. For the first dozen years of the league's existence, players skated only one hour per week at the Ice Bowl, a converted seaplane hanger at the Shipyard in Cranston, RI, where ice rental cost $25 per hour. The four house league teams consisted of 15 players each, ranging in age from 9 through 14 years. Just as today, timed shifts were used, with lines grouped by age: Bantam 13-14, Pee-wee 11-12 and Squirt 9-10. The league stayed at four teams and approximately 60 players until the early 1970's. Then, spurred by the "Bobby Orr era" and the completion of the Thayer Arena and Annex in the mid-70's, the program grew explosively, ultimately peaking at 600 kids and 7 team leagues for each of the age levels. Interestingly, there was no Instructional program until the Annex was built and little focus on the Mite age level group until the number of participants began to decline and emphasis was placed on younger players to sustain enrollment. Statewide "travel teams" began at the Bantam level during the 1962-63 season with a four team circuit that included Warwick, CLCF and two Edgewood teams. The State League blossomed in the mid 1970's as the availability of the ice and the sport's popularity rose sharply. 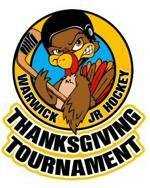 Today, Warwick Junior Hockey has a learn to skate program, a Learn to Play program for Instructional Hockey development, multiple house league teams at the Mite, Squirt and Pee-wee levels as well as 'A', 'A2' and 'B' level travel teams in our Mite, Squirt, Pee-wee, Bantam and Midget levels.